Reenactment of John Muir and President Teddy Roosevelt’s (played by Joe Wiegand) camping trip in Yosemite Valley to discuss the future of a National Park system. Teddy Roosevelt is arguably one of America’s most beloved and admired presidents. After taking the oath of office in 1901, Roosevelt used his authority to protect wildlife and approximately 230 million acres of public lands. No one embodies the spirit of Roosevelt better than Joe Wiegand who portrays our 26th president in the new IMAX film, National Parks Adventure 3D. A 1987 political science graduate of Sewanee – University of the South, Mr. Wiegand capped a 25-year career in public policy and political campaigns to take his show on the road. Chattanoogans will have the opportunity to enjoy a bully good time at the Tennessee Aquarium IMAX 3D Theater on Thursday, April 14. In advance of National Park Week, the Teddy Roosevelt Show will make a special stop in the Scenic City. Guests will have the opportunity to pose for photos with TR and to laugh at classic Roosevelt wisdom while learning presidential history and discovering the roots of the National Park system. Mr. Wiegand will introduce a special screening of National Parks Adventure 3D, then deliver a rousing reprisal of Roosevelt after the film. 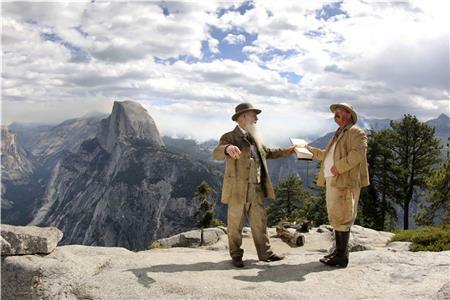 Audiences will relive the famous three-day camping trip Roosevelt spent in Yosemite with naturalist and poet John Muir. This expedition helped change the course of history, fueling Roosevelt’s determination to protect the “temples of nature” for future generations.